Warm Audio WA73 Preamp Vintage Style Lighly Used. Condition is Used. Shipped with FedEx Ground or FedEx Home Delivery. I haven’t pulled it from the rack yet but the rest of the unit looks great haven’t used it much as I purchased the preamp and eq together and no longer need this may have used it three times altogether. It’s practically new. Knobs look and work great it’s a great sounding pre really has vintage character to it. Focusrite OctoPre MKII 8 Channel Mic Preamp. Great condition and fully tested. It has some usual marks and scrapes expected on rack units. The only other thing to mention is the power switch is slightly wonky but it works fine. This will ship with a power cable and an ADAT link cable. Great condition Lindell Preamp and EQ. This is the original version. Tested and working great! Check my auctions as I also have other Lindell 500 series kit for sale. The result of these efforts is that outside of the slightly lowered headroom, our 500 Series modules are nearly indistinguishable from standard Portico Series modules, and are perfectly suited for studios of the highest caliber.". Around 46db mic gain from 20hz to 20k hz which is simply great for such an old type unit. 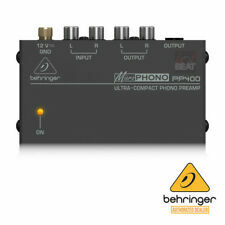 1/4" high level input great for line levels and synths drum machines, XLR line ouput. PreSonus Eureka Channel Strip at a Glance PreSonus Eureka Preamp Features The Eureka sports a compressor with variable threshold, attack, release and gain makeup. Digital option turns Eureka into DAW front end! REGGAE PRE AMP MIXER 7 CHANNEL all working unit. MIXER IS AROUND 10KG. MONITOR OUT. 7 CHANNELS 3 BAND EQ LINE/MIC. TO CLEAN POTS. COULD DO WITH A SERVICE. Focusrite Octopre, pulled from a recording studio that never got off the ground, so it is in pretty mint condition. This is the first version of the octopre, when they were still built like a tank! There is also a digital output with wordclock via Adat. PEAVEY ROCK MASTER TUBE GUITAR PREAMP PREAMP OUT 1/4" DUAL INPUT 1/4 SINGLE RACK MOUNT EXTRA LONG POWER CORD, ATTACHED 10' DESIGNED AND MADE IN USA Unit powers on and works. Hasn't been used very often, however there are several scratches on the bottom from being pulled in and out of the rack. Few scratches on top as well, but no dents or bent hardware. Has been part of our personall collection for many years, MFG 2003 Condition is Used. Focusrite OctoPre Dynamic MKII, 8 Channel Mic Preamps/ 8 compressors. A fully functioning unit but without original packaging, sorry. Any questions feel free to contact me on 07596927232. Pr Roberts 720 Tape Deck Preamplifiers, Single Ended EL84. Low hours with original tubes. There are many ideas of what other people have done with this circuit. Each preamp has an AC cord added for testing. Here is a PreSonus digimax LT 8 Channel microphone preamp in great condition. He said everything works great and it powers up fine as you can see in the pics. Other than that, it spent most of it's life inside of a gator rack. 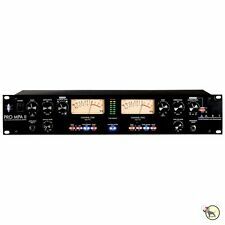 PreSonus Studio Channel Recording Tube Mic Pre-Amp w/Compressor Equalizer New. Condition is Used. Shipped with USPS Priority Mail. Fixed gain at around 25db on the spec sheet. Pair Legendary Telefunken V672 Preamp Modules. Earlier version with Telefunken output transformer. Electrolytics replaced w/nichicon caps. Ready to be racked up. Serial#s 7000 and 7169. Der Voicemaster Pro kann sauber und leise verstärkt werden, oder er kann verwendet werden, um einen Sound über seine verschiedenen Verarbeitungsabschnitte radikal umzugestalten. Der Expander funktioniert hervorragend mit Gesang und ist sicherlich viel anwendungsfreundlicher als ein normales Gate. Video of STUDIOCHANNEL Item Code: STUDIOCHANNEL . PRESONUS STUDIO CHANNEL RECORDING TUBE MIC PRE-AMP STRIP WITH COMPRESSOR AND EQUALIZER BUILT IN. #1 Authorized Presonus Internet Dealer! The Studio Channel noticeably outperforms preamplifiers that are built-in to most recording interfaces and affordable mixers. The Grace m101 sports updated components inside and out. With incredible bandwidth, headroom and resolution, the Grace m101 is remarkably natural, musical and detailed. Also, the Grace m101 is equipped with an extended gain range input (10-75dB) 'Grace Designed' for gain-hungry ribbon microphones.Plug The Grace m101 In. The OBP-3 is Aguilar’s most flexible onboard preamp design, providing /-18dB of cut and boost at 40Hz, /- 16dB of cut and boost at either 400Hz or 800Hz and /- 16dB of treble cut and boost at 6.5 kHz. Item works and is fully tested. Lived in a bedroom studio for the duration of its use. Unit is in perfect working order and is in near-perfect cosmetic condition. An excellent 2-channel mic pre with plenty of clean gain. Comes with power cable. Focusrite ISA-TWO ISA2 Dual Mono Microphone Preamp USED. Condition is Used. It is a Manley Voxbox in excellent condition and is working perfectly. As with all estate sales, everything is sold as is with no warranty of any kind. You will receive the item in the photos. The EL-8XM provides the aggressive "all buttons in" characteristics obtained from the classic LN1176, courtesy of an onboard British Mode switch. While the Distressor can function very smoothly and transparently, the addition of the British Mode allows it to take on a very "un-subtle" character, giving you the best of two compressors in one! The aural quality has often been characterized as a creamy, smooth tone with a surprisingly open, clear top-end. The sound, as explained by many users, has "warmth" and punch, but with a "beautiful" expanded top end. Condition is Used. 2 x USB 2.0 1 x USB 3.0 Video Ports. Dell Screen Size. 500GB HDD Optical Drive. 4-Cell 40 WHr Weight. Yes Battery. (Optional) Other Display Specs. No Bluetooth. Seventh Circle Audio CH02 Rack with T15 Module in great and working condition T15 meticulously built while I was attending Clemson University and I was reviewing circuit design. Feel free to message me with any questions! ART Pro Audio Pro MPA-II Two Channel Mic Preamp. The new ART ProMPA II is the next generation in affordable high performance microphone preamptechnology. Each microphone input circuit, with selectable 48v phantom power, features variable input impedance which can radically vary the overall performance of any high quality dynamic or ribbon microphone. Great sounding high end mic pre. SSL 4K Stereo Channel Strip. Soundskulptor MP 573, Preamp für API-500 Lunchbox, neu ! Zustand: neu ! Just install it in your API-compatible Lunchbox rack and start recording. Eingangs- und Ausgangübertrager von Carnhill. Kein Händler ! Ein gesetzlicher Anspruch. auf 14-tägiges Rückgaberecht besteht ebenfalls nicht. Focusrite OctoPre MkII 8-channel Mic PreAmp 24-bit/96kHz ADAT Output Works Great. Condition is Used. This unit has been fully tested and it works perfectly without issue. Could use a good cleaning to remove first/dust and masking tape residue. Otherwise excellent cosmetic condition with light scratches along the top and sides. This is an Aphex Systems Model 207 Two Channel Tube Mic Preamplifier was pulled from a working rack and is in working condition. Tube is good. Exterior and Interior of unit is very clean. MINT Totally unmarked. MINT- Almost unmarked, only very tiny rubs. VG Heavily used but still working. EXC Very minor signs of use only. Gradings guide. Factor in an incredible 80dB of gain, and you've got a preamp that's ready to bring out the best of any microphone - condenser, dynamic, or ribbon. Original Box is included. -Sonically-versatile mic preamp and DI module based on the classic 1073. This style of preamp is often referred to as "the sound of Rock n' Roll" for its BIG punchy low end and smooth open top end. The WA-412 has all of the features one would expect from this style of preamp. and more.